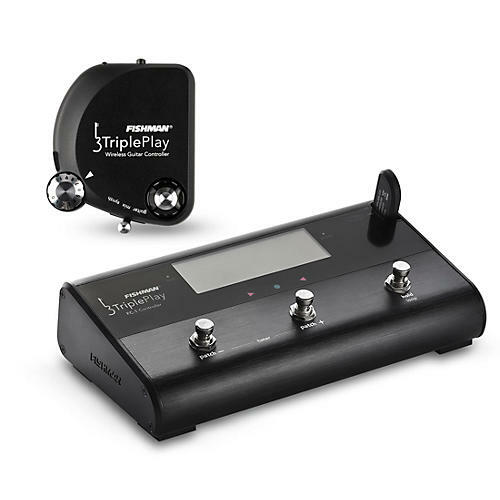 TriplePlay is the composing, performing and recording system that puts an unlimited palette of instruments and sounds at your fingertips - all with the freedom of wireless control. Compose music with unparalleled tonal options. Easily share arrangements with your band. Switch between instruments, or play up to four instruments at the same time. Teach or learn faster with accurate notation. Create video soundtracks. Mix your own samples, beats, loops and tracks. This special package includes the FC-1 Floor Controller for maximum versatility. TriplePlay comes complete with all the software you'll need for recording, editing and playing back your music. Take full advantage of powerful MIDI features with your guitar. With the easy and blazingly fast note encoding, preset editor and mixing console, you'll be mixing your own music in no time.